Instagram @JD.AsEyeSee where you can follow, comment, and stay in touch. Facebook LIKE @AsEyeSee FB page to stay current with news including information on the first self-published book by JD Brummer available now featuring some of her most popular Abstract art pieces and their inspirations! 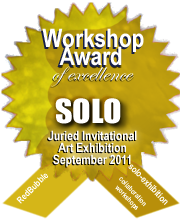 given to the work best exemplifying the attitude, effort, and results to which the Solo Exhibition Workshops aspire. Thank you all for your continued encouragement, support, and inspiration. I am truly honored to be among such talented and respected artists! MY WORK, "Force of Nature", HAS BEEN NOMINATED FOR SoJie 18! My Last Sojie Workshop Exhibition of this Season! LOOK!! Earned Two Photography Awards today!! As Eye See Artistry that "Rocks" As Eye See Artistry that "Rocks"